How Steel Forging Compare to Steel Casting? Home » News » How Steel Forging Compare to Steel Casting? Today steel forging and steel casting have been the two main production processes for steel parts. Compare to steel casting, there are a lot of advantages to use steel forging as the metal forming process. Steel casting can not obtain the strengthening effects of hot and cold working. Steel forging surasses steel casting in predictable strength properties-producing superior strength that is assured, part to part. A steel casting has neither grain flow nor directional strength and the process cannot prevent formation of certain metallurgical defects. Preworking forge stock produces a grain flow oriented in directions requiring maximum strength. Dendritic strucures, alloy segregations and like lmperfections are all refined in steel forging. Due to the differences of production equipments between steel casting and steel forging, according to our experience, we can produce about 30t of steel forging a day. However,the production capability of steel casting is much lower. For this, purchasers will prefer to steel forging when considering the process. When pressing the heated steel billet between forging dies, steel will fill the die cavity and the redundant steel will be around the shape of product, which is called flash. So the waste of whole forging process is the flash. That is why steel forging is a net or near net shape process compare to steel casting. Also, although the cost of forging dies are higher than that of casting molds, but the unit cost of steel forging is much lower than steel casting. So in terms of cost, when the quantity is large, steel forging is more cost-effective. 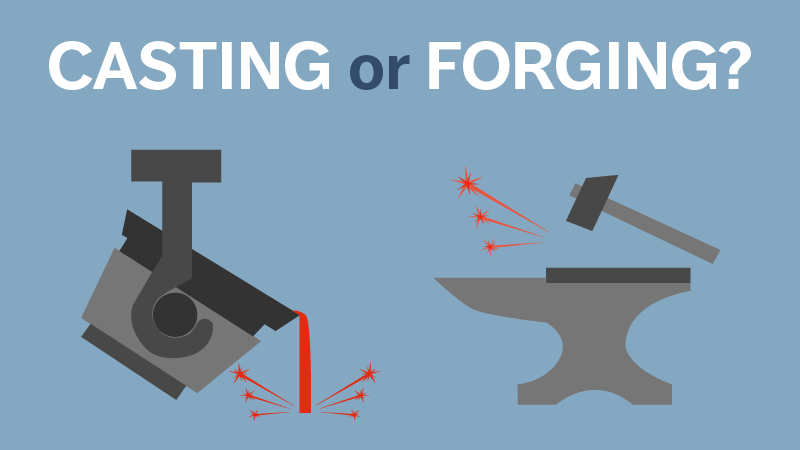 But just how much better is a steel forging than a steel casting? Below is the research we ever did for the same designed part in different process. Steel forging parts had a 26% higher tensile strength than the steel casting parts. This means you can have stronger products at a lower part weight. Steel forging parts have a 37% higher fatigue strength resulting in a factor of six longer fatigue life. This means that a steel forging part is going to last longer. Cast iron only has 66% of the yield strength of forged steel. Yield strength is an indicator of what load a part will hold before starting to deform. The steel forging parts had a 58% reduction in area when pulled to failure. The steel casting parts only had a 6% reduction in area. That means there would be much greater deformation before failure in a steel forging part. We are the publishers of a bimonthly magazine ‘Forgings Today’ which is India’s first and only magazine exclusively devoted to Forging Industry. The magazine incorporates technical write-ups, new and developments, data analysis and other commercial information which are of interest to engineering industry in general and forging sector in particular. Forgings Today would like to congratulate you for undertaking the huge task of writing a technical write up on on How steel forging compare to steel casting? With a view to spread technical awareness among forging fraternity, we would like to publish your article in our magazine with due acknowledgement. In case you support our technology awareness mission, please let us have the updated and editable version (4 to 5 pages) of the same along with the high resolution photographs and illustrations of the technologies and latest snaps of the authors.